From the Editor: Dr. Al Maneki retired in 2007 after working as a mathematician for the U.S. Defense Department for thirty-three years. He is currently treasurer of the Science and Engineering Division of the National Federation of the Blind. 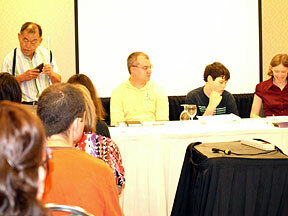 One of the workshops sponsored by the National Organization of Parents of Blind Children at our 2010 convention was called "I Survived Math Class." The purpose of this one-hour workshop was to offer support and encouragement to the parents of blind and visually impaired students who will be taking math classes, possibly for the first time. As the moderator of this workshop, I would like to provide a summary of the proceedings. I hope that interested persons who could not attend may benefit from the exciting presentations and the lively discussions. The workshop panelists were Alyssa Bates, Michael Taboada, and Dave Schleppenbach. Each panelist spoke for ten minutes, with time allotted immediately afterward for questions. The final minutes of the workshop were devoted to general discussion and audience participation. Alyssa Bates was our first panelist. She is a senior at Penn State University, majoring in meteorology. She received an NFB scholarship in 2008. Alyssa's partial vision enables her to read and write large print. She described the difficulties she had using protractors, rulers, and graphing calculators throughout her school years. Either the print was too small or the light/dark contrast was not sufficient. She found the use of CCTV's for reading textbooks unsatisfactory and preferred reading textbooks close up. She has never had trouble writing her math homework assignments. (In a recent phone conversation Alyssa told me that this year, for the first time, she has been reading e-books on her computer with the screen magnification features provided in the newer versions of the Windows operating system.) Finally, Alyssa expressed regret over not having had Braille instruction and access to recorded materials in her early school years. In her concluding remarks, she strongly encouraged parents of partially sighted children to obtain educational opportunities in all three reading media so that their children will be able to use the reading medium of their choice at the appropriate time. The second panelist was Michael Taboada. Michael is a freshman at Louisiana State University and is majoring in computer science. His parents are longtime members of NOPBC, and Michael has benefited from the summer programs at the Louisiana Center for the Blind and Blind Industries and Services of Maryland. He is a longtime Braille reader and has had the good fortune to have Braille math textbooks. He has learned to do math assignments on a Braille notetaker. In his talk, he described how he developed special notations to represent mathematical expressions in linear form rather than using the subscript and superscript notations commonly found in print. His method allowed him easy access to these expressions on his notetaker without the somewhat cumbersome symbols for subscripts and superscripts provided in the Nemeth Braille code. He was able to generate printed homework assignments for his sighted teachers without the need to rely on Nemeth-to-print translation. Michael and his teachers had to develop an agreement about how subscripted and superscripted expressions would be represented in linear form. Obviously, this entails extensive use of bracketed and parenthesized expressions. Also, special conventions had to be agreed upon for certain mathematical symbols that are graphical in nature. When I phoned Michael as I prepared this article, he told me that he is taking calculus I and introduction to Java programming in his first semester at LSU. The final panelist was Dave Schleppenbach, president of gh, LLC, a technology company that helps people with print disabilities access information. Although Dave is sighted, he has a thorough understanding of the problems confronting blind persons when they take math and science classes. In his talk, he correctly argued that if we are to have access to the print media, we must have simultaneous access to charts, diagrams, and text of all fonts. All three of these may occur in any order or arrangement. The complete transcript of his remarks appears elsewhere in this issue. The questions and discussion throughout this workshop were very lively. The audience wanted specific details about how blind students learn math and do their homework. In this discussion, the need for a student to work math problems on paper with an old-fashioned Brailler became very apparent. There was much discussion about how math tests can be administered without Braille. The need for a student to develop the ability to do math with the use of a sighted reader was also heavily stressed. By the end of this workshop it was clear that there are no universal answers to fit all situations. It is important for all parents and blind students to keep an open mind about the problems confronting them and to realize that solutions must be worked out to fit individual situations. Over the remainder of the convention a number of parents approached me and said that they found this workshop interesting and extremely helpful to them. I came away convinced that this workshop should become an annual event at our national conventions. There is an urgent need to answer questions about how blind students can learn and do math effectively. In the past, it has been all too easy for blind students to be exempted from math requirements at the secondary school and university levels. While this might be an easy way out for teachers and administrators, it is doing no favors for our blind students. In future workshops I think we should hear from some non-STEM majors who were required to take at least one college-level math course. Certainly not all of us are cut out to be meteorology or computer science or math majors. People studying the fine arts, social sciences, and humanities are equally entitled to math literacy. Future workshops should also include discussions about tactile graphics. For the past two years I have worked closely with the School of Engineering at the University of Vermont to enhance methods by which blind students can create tactile drawings. I believe that this work is on the verge of bringing commercial products to market which will enable blind persons to draw and edit their own diagrams. Since I did my undergraduate and graduate work in mathematics over forty years ago, I know that my approach and attitude to doing math may be somewhat dated. While I took notes in hardcopy Braille, I used live readers to write my homework assignments, my dissertations, and my professional publications. Therefore, while I am comfortable serving as a workshop moderator, mine is not the last word on how blind people can best do math in the framework of today's demands and resources. If you have questions about how your child or student can handle math classes, there is no need to wait for the next workshop. Contact me by email at apmaneki@earthlink.net or by phone at (443) 745-9274. If I don't have the answers, I'll find the right people to help you. Let's make the math experience enjoyable and beneficial for everyone. I look forward to hearing from you.